The third of four volumes, THE ANNOTATED SANDMAN reprints Neil Gaiman's THE SANDMAN with annotations by Leslie Klinger (The Annotated Sherlock Holmes, The Annotated Dracula) that delve into the historical and literary references contained in the series. In this volume, Leslie Klinger provides historical insights into issues #40-55 of THE SANDMAN, along with THE SANDMAN SPECIAL #1 and "How They Met Themselves" from VERTIGO: WINTER'S EDGE #3. 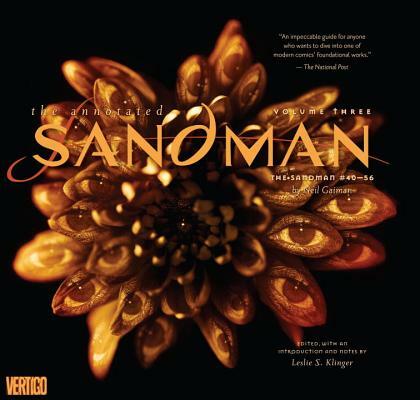 New York Times best-selling author Neil Gaiman's transcendent series SANDMAN is often hailed as the definitive Vertigo title and one of the finest achievements in graphic storytelling. Gaiman created an unforgettable tale of the forces that exist beyond life and death by weaving ancient mythology, folklore and fairy tales with his own distinct narrative vision. THE ANNOTATED SANDMAN is a must-have for any die-hard fan or newcomer to the series. Collects #40-55 of THE SANDMAN, along with THE SANDMAN SPECIAL #1 and "How They Met Themselves" from VERTIGO: WINTER'S EDGE #3. Neil Gaiman is the NEW YORK TIMES best-selling author of AMERICAN GODS and CORALINE. His other books include the novels ANANSI BOYS, NEVERWHERE and STARDUST (winner of the American Library Association's Alex Awards as one of 2000's top ten adult novels for young adults) and the short fiction collections M IS FOR MAGIC, FRAGILE THINGS and SMOKE AND MIRRORS. With Roger Avary, he is the screenwriter of the motion picture BEOWULF (Paramount, November 2007), direct by Robert Zemeckis. His illustrated novel STARDUST was released as a major motion picture Summer 2007 starring Michelle Pfeiffer and Robert De Niro. With Terry Pratchett, he is the author of the novel GOOD OMENS. He is also the author of the children's books THE WOLVES IN THE WALLS and THE DAY I TRADED MY DAD FOR TWO GOLDFISH. Among his many awards are the Eisner, Hugo, the Nebula, the World Fantasy and the Bram Stoker. Originally from England, Gaiman now lives in the United States.